Being traditionally British, I can be far too polite. I queue in all the right places, I apologise for everything and I don't like to put people out. Which means I see the signs in bookshops saying "help yourself to tea and coffee" but never like to be cheeky enough to actually do so. 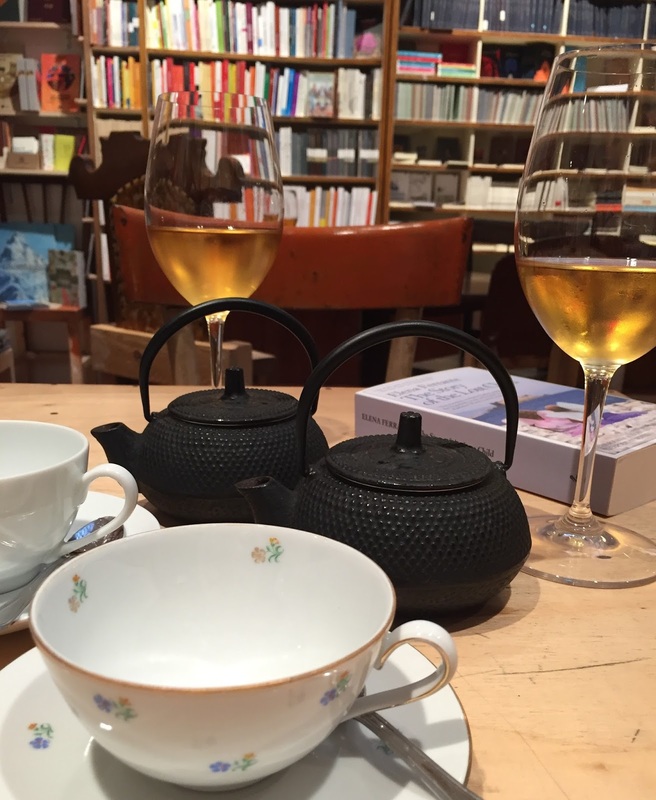 If a bookseller offers tea I won't turn it down – I am British after all – but the thought of asking for a cup brings me out in a cold sweat. Which is exactly the situation I was in during my visit to Toppings & Company in Bath when I finally plucked up the courage and asked for some tea. 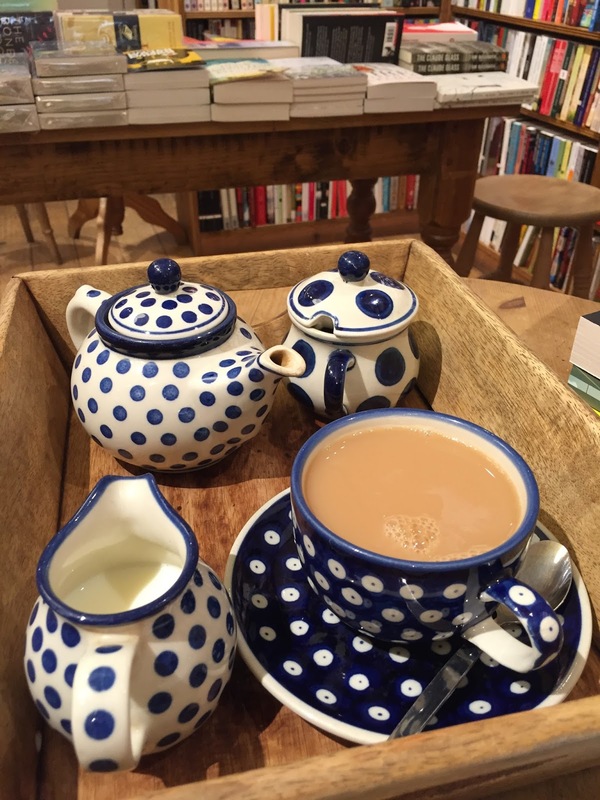 You see, this was my third visit in as many days and I'd seen other people drinking out of beautifully matching blue and white spotted cups and saucers and I knew I had to do the same. Only I couldn't quite pluck up the courage to ask. 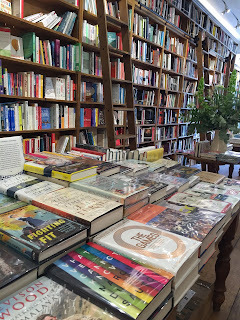 Admittedly, the first visit had taken place with a friend, so we'd mostly been chatting about the books and enjoying the beauty of this very elegant bookshop at what I came to think of as the top of the town. But on the second visit I was completely on my own (and kicking myself for not asking for a cuppa when I'd previously had moral support). I'd even seen other people asking for their own drinks. Maybe I suffer a little from anxiety – although I think of it more as excessive politeness – but I just couldn't do it. 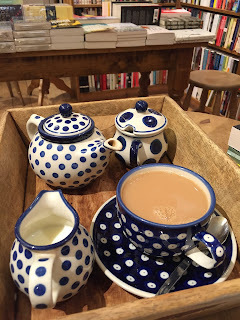 Finally, on my third trip to the bookshop, having already been browsing for a good half an hour and chosen a potential purchase in the first five minutes, I approached a bookseller and asked about a cup of tea. He replied with a friendly smile, said something like "no problem" and went to get brewing. I continued browsing. 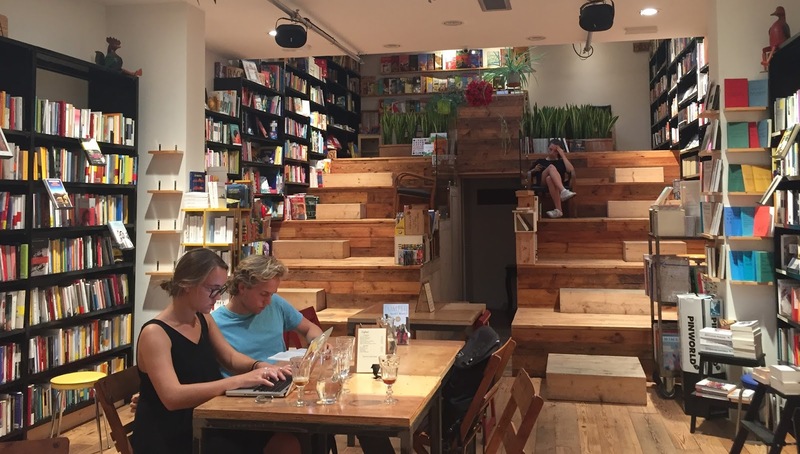 Toppings is a long bookshop, thin at the front then gradually opening out into a relatively large and inviting space, with an extra room at the back just in case you've not found enough books to buy already. I'd started at the front, where non-fiction lines the walls and recommends tables called to me. Rows of smart wooden ladders were the extra detail and this became another bookshop where I found myself wishing I could have a room such as this to use as my own personal library. The recommends tables kept me for some time, and I found myself often returning to Tim Marshall's Prisoners of Geography. Fiction takes up a large area in the back of the main part of the bookshop, with the cheerful children's section to one side so parents can happily browse while their youngsters are safely tucked away and entertained in their own right. When my tea tray was delivered – and even more beautiful than I'd anticipated because it was mine to enjoy – I made myself comfortable at one of the tables with a pile of novels from the fiction recommends table (and the previously mentioned title) and began my dithering process. The Portable Veblen by Elizabeth McKenzie kept drawing me in, but whether it was for the name, the cover or the promise of the actual content I couldn't say, and so I again accosted a friendly bookseller. I'd seen a chalk board listing the staff's current reads so I knew McKenzie's book was being read by someone, it was an easy start to the conversation. Typically that particular bookseller was on their day off but it didn't stop us from having a good chat anyway. Which lead to more dithering on my part – should I buy the Veblen or return to the geography? No prizes for guessing how that question was resolved. Topping & Company in Bath is a delightful place to while away a few hours, and given the lateness of its hours (9am-8pm) if I lived nearby I'd happily conclude my working day with a spot of bookshopping – I might even ask for another cup of tea. There's something particularly wonderful about walking into a bookshop, beginning to look around and then having an enthusiastic bookseller come rushing over because he wants to have a chat. The fact the bookseller in question happened to be a handsome young Italian man was an added bonus. He'd spotted the tote bag I was carrying* and wanted to know where he could get some to sell in his bookshop. It was a question I couldn't answer, but thanks to the joys of Twitter I did my best to put him in touch with someone who might have been able to help. 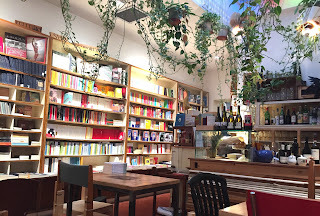 So anyway, I guess you're wondering where this Italian bookseller can be found and how you get to meet him? Well you have to travel to Florence. 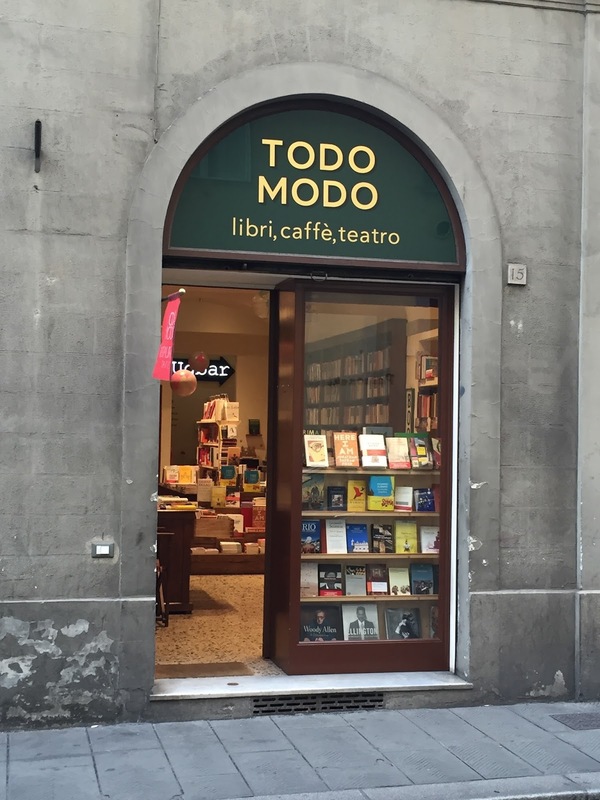 Todo Modo bookshop is a stone's throw away from Ponte alla Carraia and a must-visit destination in the city. 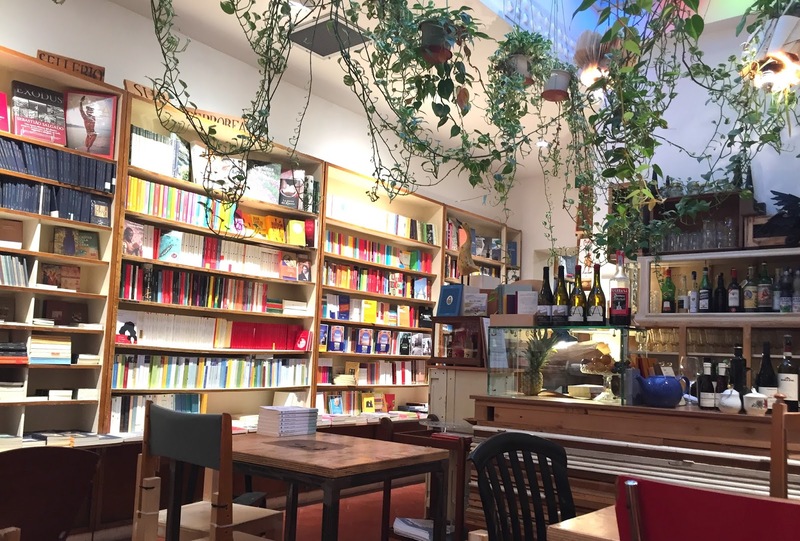 In fact, it's such a good destination this bookshop (which I believe is still relatively new) is already listed in the Lonely Planet guide to Florence and Tuscany. From the street, you could almost be forgiven for missing Todo Modo, which is marked only by a small archway housing the window and door. Look inside and it's a lovely looking space with globes hanging from the ceiling and dark wooden dressers with books displayed in opened drawers, but there isn't a lot to appreciate if you're not a native speaker. 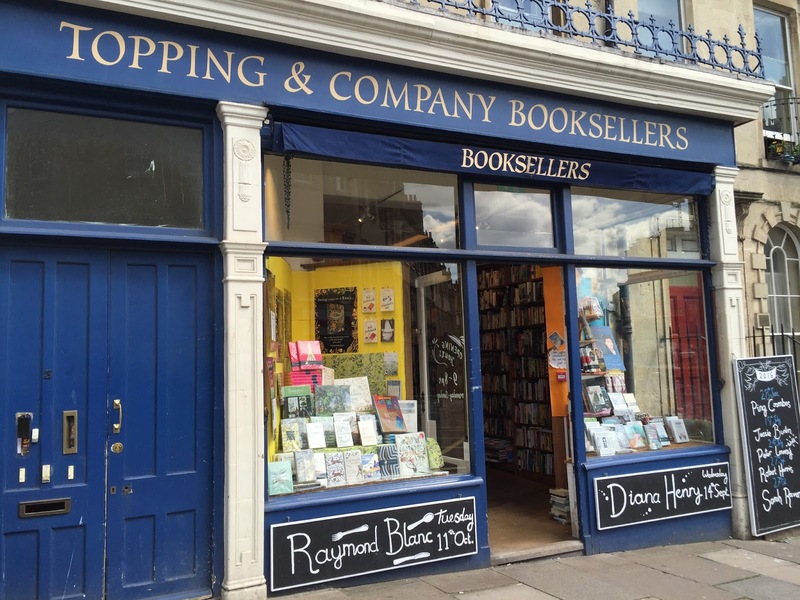 Fortunately, the friendly bookseller also told me where I'd be able to find the English language books – walk to the back of the bookshop's front room and a long corridor opens your eyes to the realisation the shop's frontage is no indication of how big it is. 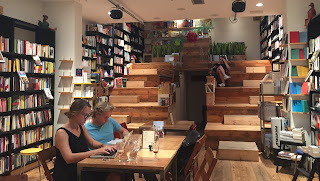 Not only are there two more rooms of books, there's also a large cafe bar area (with an extensive offering of tea and wine, we had both) and a large stepped area that appears to double up as seating should there be any entertainment. These rooms are all hidden behind the other shops on the street, but the resulting absence of windows only caught my attention when looking through my photos afterwards because it meant more space for bookshelves. A large skylight and clever lighting mean it's still bright and welcoming, and a scattering of chairs were being enjoyed by relaxed looking browsers. More people were sat at the tables, adding to the gentle buzz of people enjoying this friendly, modern bookshop. We made our way to the English language section, which is obviously out of the way, at the top of the stepped wall and therefore enjoying a vantage point over the rest of the bookshop. There was a surprisingly large selection of English books and I could've easily chosen any number of titles from their selection, but – having seen it in its native Italian at the front of the bookshop – my obvious purchase had to be Elena Ferrante's The Story of the Lost Child. 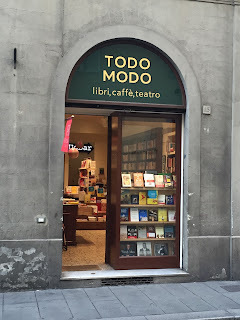 My lack of language skills meant it was impossible for me to fully appreciate the books surrounding me, but as a bar and a book-filled venue I can definitely recommend Todo Modo and its exuberantly welcoming bookseller. It's a bookshop I'd love to have the opportunity to return to and who knows, next time I might see Penguin tote bags on sale among the Italian paperbacks.